Tomas Milian stars in this flawed Mexican set Spaghetti Western from left-wing director Sergio Sollima. Blue Underground R0 USA disc. While the American West was patrolled by the single-named sharp shooting anti-heros always on the look out for the men who killed their father or wife, down in Mexico, things were more complex and political. Mexico, the revolutionary years: Cuchillo (Tomas Milian) is an ace knife-thrower, but only a lowly peasant and is forced to steal to feed himself. After winning some money in a bet, he gets arrested and ends up sharing a prision cell with revolutionary poet Ramirez (José Torres). Ramirez is set to be released in the morning, but offers Cuchillo $100 to help him escape. It turns out that Ramirez knows the location of $3 million in gold intended to fund the revolution, but there are lots of other groups after it as well. Ramirez is killed by some revolutionaries trying to get the information out of him and with his last breath tells Cuchillo to go to Burton City, Texas and keep the gold safe. Cuchillo heads north to the border persued by revolutionary gangs, two French mercenaries working for the government, Cassidy (Donald O'Brien) a sheriff turned bounty hunter, and finally, Cuchillo's fiancé Dolores. On the way he meets a woman from the Salvation Army and rides with her into America. At Burton City Cuchillo teams up with Cassidy and they have to work together to find the gold and secure its safe passage back to Mexico. Writer and director Sergio Sollima was, like many european directors, torn between art, politics and exploitation, but Sollima was frequently able to make it work and produce good looking films, in the popular genre of the time, and with some powerful political themes - Run, Man, Run was Sollima's third and final Western but doesn't quite work as well as it should. The storyline is typical of the Mexican revolution Spaghetti Westerns with a lowly peasant getting caught up in the revolution and learning that he can make a difference - Sollima writes in dozens of colourful and distinctive characters all with their own motivations and different outlooks on the use of violence, the ex-Sheriff Cassidy is nicely enigmatic and the secret service agents are suitably slimy although not pure-evil. The pacing is quite slow for a Euro-Western and the film does drag at points, with some very unnecessary comedy scenes particularly with the Salvation Army woman. The ending is particularly poor with a completely pointless duel that seems to serve no purpose to the plot. Sollima's direction is strong, he uses a lot of very wide shots to show-off the very impressive locations and large casts - the good exteriors give a very strong Mexican feel to the film throughout and it is hard to believe it was all shot in Spain. Ennio Morricone and Bruno Nicholai give the film a good orchestral soundtrack with an opening song sung by Tomas Milian himself and a recurrent theme that his character hums throughout. Tomas Milian was fast becoming an Italian film star thanks to the Spaghetti Westerns and having appeared in both of Sollima's previous Westerns, had the role of Cuchillo specifically written for him. Managing to convey a child-like innocence in some scenes, he is equally convincing as the hardened knife-thrower and is prepared to kill to defend himself. The rest of the cast play well, and many of them will be instantly recognisable to Spaghetti Western fans, Donald O'Brien (Town Sheriff in Four of the Apocalypse (1975) and slimy villian in Mannaja (1977)) plays Cassidy, Gianni Rizzo as Burton City Mayor would play a similar role in all the crazy Sabata films, while the unfortunate and uncredited Austrian killed in a saloon by Yul Brynner's Sabata crops up here in a similar role. 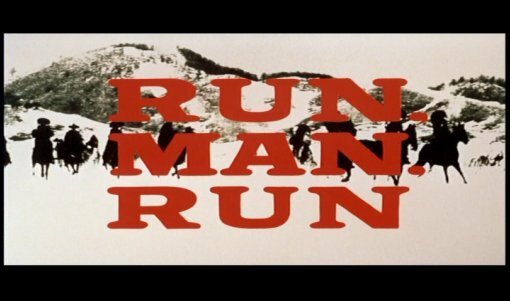 Run, Man, Run is thematically very similar to Damiano Damiani's Bullet for the General (1967) and Sergio Corbucci's Companeros (1970) that even has Tomas Milian in an identical role, however it stands as inferior to these other two. Bullet for the General has some very impressive cinematography, strong pacing and some good stand-out scenes (the opening on board a train is perfect) as well as a nice turn of plot towards the end, Companeros is much more light-hearted and a very entertaining and fun film. Run, Man, Run falls awkwardly, it tries to be serious, with some elements of comedy but ends up dragging in too many scenes. Certainly not a poor film - with good direction, music and acting - the storyline is a failed attempt at trying to be too big, something that Sollima would eventually achieve with the superior Revolver (1973). I would partially recommend this films to fans of Sollima or the political/revolutionary Westerns, but its probably not for fans of the American-style Spaghetti Westerns and Bullet for the General (1967) is a much better starting point. It it a sequel? The character of Cuchillo was carried over from Sollima's earlier The Big Gundown (1966), and this film has been called The Big Gundown 2, but no reference is made to the earlier film. Directed by anyone interesting? Sergio Sollima - a strongly left-wing director who directed films in all the Italian genres from peplum to crime. Any violence? Quite a lot of gunfights and knife-throwing, some blood. Good soundtrack? Ennio Morricone provides a catchy and memorable main theme, sung by Tomas Milian himself. An okay film that tries to be more than it can be, partly recommended to fans of Sollima or political Westerns. The image is good - lots of grain and some scratches and speckles but generally good for its age. Audio Italian and English language - Dolby digital mono. Sound fine. Westerns Italian Style - a fascinating genre documentary from 1968 with extensive (and spoiler filled) behind-the scenes footage of this film and The Great Silence (1969) among others, includes interviews with directors and actors including Enzo G. Castellari and Sergio Corbucci, as well as a look at the influence of the Euro-Westerns on Italian culture. Narrated by Frank Wolff. English, part subtitled. (37m 59s). Poster and Stills gallery, manual scrolling, 26 images. Talent Bios, onscreen detailed biographies of Milian and Sollima. Other regions? German R2 release with English subtitles and Italian/German audio, includes an additional interview with Sollima, but no English options. Cuts? The film is believed to be fully uncut. Titles and credits are in English. A well directed and acted film that is let down by a poor plot that tries to over-reach. Only for fans of the political Westerns. A solid DVD - the print is good with choice of audio tracks and interesting interviews. The inclusion of the fascinating contemporary documentary makes this a must-own-disc for genre fans (it is also available on the German Spara, Gringo, Spara disc). Find reviews of our other films scored by Ennio Morricone or starring Tomas Milian. All text in this review written by Timothy Young - 3rd July. 2006.